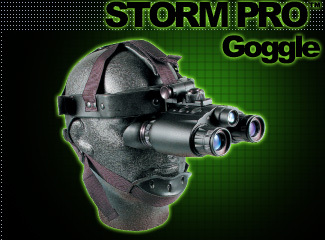 An ultra compact, ergonomically styled Gen 1 binocular goggle with all-metal bodyshell . The ‘wide view’ eyepieces are internally focusing so they do not affect eye relief when focussed. The 2 x 26mm f1.4 lens offer 1.0x magnification with a wide 40° field of view. Power is provided by 2 x 1.5V Alkaline LR1/MN9100/Type N batteries (not supplied). A short-range Infrared Illuminator is built-in and powered by the scopes batteries. This has recently been updated to include a zoom facility offering wide area and spot beam. The lightweight headmount offers a flip-and-lock facility, safety lock, eye-relief adjustment and replaceable leather forehead/head pads. Optional 80mm f1.7 lenses convert the unit in to a hand-held 3.6x magnification binocular. 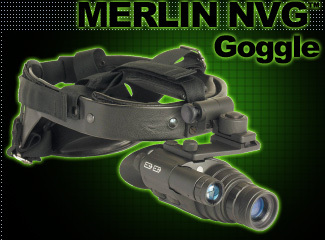 Based on the Merlin™ monocular, the Merlin NVG™ offers a high grade Gen 1 image intensifier tube in a compact, lightweight and partially rubber armoured bodyshell. The lightweight headmount offers a flip-and-lock facility, safety lock, eye-relief adjustment and replaceable leather forehead/head pads. Offering 1.0x magnification as standard, 80mm (4.0x), 100mm (5.0x) and 120mm (6.0x) lenses are available as optional extras. The built-in Infrared (IR) Illuminator has a variable beam setting allowing it to be focused from flood to spot so that it can be used with all lens options. 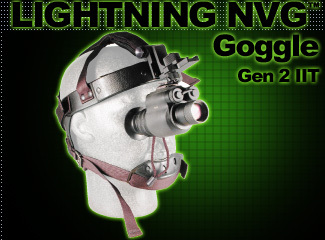 Compact, lightweight Gen 2 biocular goggle. Features ergonomic eyecups and adjustable interpupillary movement. Headmount offers flip and lock, safety lock, eye-relief adjustment and replaceable leather forehead/head pads. A small, short-range IR illuminator is built-in. Optional high power IR illuminators improve usable range in very low light/total darkness. The unit can be converted to a hand-held high magnification biocular with the addition of telephoto lenses - the 7013 100mm f1.5 and 165mm f2.0 which offer 4.0x and 6.3x image magnification respectively. 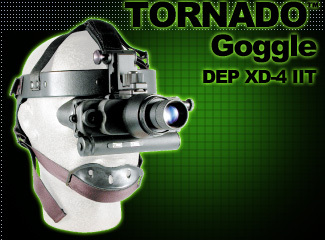 Top of the range high grade Gen 2+ biocular goggle. Features a tried and tested bodyshell with ergonomic eyecups, interpupillary movement, a built in short range IR illuminator, a low battery warning LED indicator and an IR active LED indicator. Headmount is lightweight and offers a good level of eye relief adjustment. Supplied with a pouch case, sacrificial lenses, different size brow pads and cleaning tissues. Based on the ultra-compact, lightweight Lightning™ multipurpose Gen 2 monocular with a rugged, all-metal bodyshell. Power is supplied by 2 x AA/MN1500 1.5V Alkaline batteries. 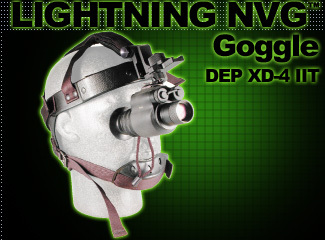 Supplied as standard with a compact 26mm f1.1 lens, the Lightning NVGsup>™ offers parity (1.0x magnification) with an ultra wide 40° field of view. The lightweight headmount that is included offers a flip-and-lock facility, safety lock, eye-relief adjustment and replaceable leather forehead/head pads. For longer range observation, optional multicoated lenses are available offering 4.0x and 6.3x magnification. A 3x Lens Converter can also be fitted to the standard 26mm f1.1 lens to give 3.0x image magnification. A low power, close-range 5mW IR Illuminator is built-in as standard. Optional high power 75mW and 150mW IR Illuminators are available for longer range use in very low light/total darkness (NB these cannot be fitted at the same time as the headmount). A weapon mount adaptation is available that allows use with either an active red dot laser sight or alternatively mounted behind a passive Aimpoint® red dot or EOTech Holographic sight. An SLR/Video Camera Adaptor is supplied as standard. The adaptor has 37mm and 52mm threads that allow the unit to be fitted to the filter thread of camera lenses. A tripod thread is fitted as standard and the unit is supplied with a shoulder/belt-mount pouch case. 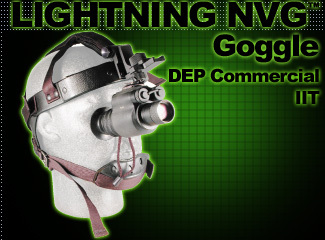 Compact, lightweight biocular goggle fitted with a Photonis-DEP Commercial grade Image Intensifier Tube. Features ergonomic eyecups and adjustable interpupillary movement. Headmount offers flip and lock, safety lock, eye-relief adjustment and replaceable leather forehead/head pads. A small, short-range IR illuminator is built-in with the option to fit a 7028 IR Telephoto Lens. Optional high power IR illuminators improve usable range in very low light/total darkness. The unit can be converted to a hand-held high magnification biocular with the addition of telephoto lenses - the 7013 100mm f1.5 and 7015 165mm f2.0 which offer 4.0x and 6.3x image magnification respectively. A 7029 3x Lens Converter can also be fitted to the standard 26mm f1.2 lens to give 3.0x image magnification. Compact, lightweight biocular goggle fitted with a Photonis-DEP MilSpec Gen 2+ Image Intensifier Tube. Compact, lightweight biocular goggle fitted with a Photonis-DEP MilSpec SHD-3 SuperGen Image Intensifier Tube. Compact, lightweight biocular goggle fitted with a Photonis-DEP MilSpec XD-4 HyperGen Image Intensifier Tube. 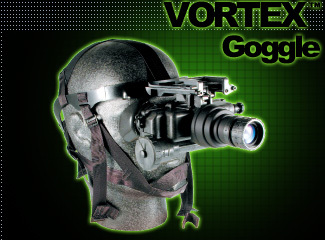 Compact, lightweight biocular goggle fitted with a Photonis-DEP MilSpec XR-5 Auto-Gating HyperGen Image Intensifier Tube. Based on the ultra-compact, lightweight Lightning™ multipurpose Gen 2 monocular with a rugged, all-metal bodyshell. Fitted with a Photonis-DEP Commercial Grade Image Intensifier Tube. Power is supplied by 2 x AA/MN1500 1.5V Alkaline batteries. Based on the ultra-compact, lightweight Lightning™ multipurpose Gen 2 monocular with a rugged, all-metal bodyshell. Fitted with a Photonis-DEP MilSpec Gen 2+ Image Intensifier Tube. Power is supplied by 2 x AA/MN1500 1.5V Alkaline batteries. Based on the ultra-compact, lightweight Lightning™ multipurpose Gen 2 monocular with a rugged, all-metal bodyshell. Fitted with a Photonis-DEP MilSpec SHD-3 Image Intensifier Tube. Power is supplied by 2 x AA/MN1500 1.5V Alkaline batteries. 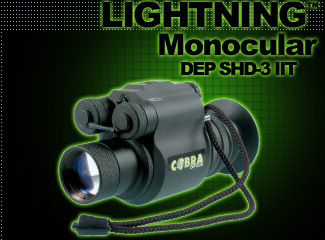 Based on the ultra-compact, lightweight Lightning™ multipurpose Gen 2 monocular with a rugged, all-metal bodyshell. Fitted with a Photonis-DEP XD-4 HyperGen Image Intensifier Tube. Power is supplied by 2 x AA/MN1500 1.5V Alkaline batteries.